When teaching movement I use the rule of 5,000: Anything you do 5,000 times… you own it. This is probably true of other matters of discipline as well. The following sequences come from a private lesson I did this evening with one of my hard-working students. Mostly this was a study in how the dog understands direction based on the set of the handler’s feet. This is a simple concept really. The handler wants to send the dog onto the pipe tunnel while the dogwalk is clearly an enticement. The handler might rely on using a clear verbal command and might even try to get some mileage out of flapping his arms. But the key to this is probably for the handler to face in the direction the dog should move. You’ll note at the top of the drawing is a bit of text that says “clock” and another that says “door”. So… I ask my student to face the clock when sending the dog on to the pipe tunnel. Note that facing is largely a thing that begins with the placement of the feet; both the left foot and more importantly (with dog on left) the right foot. In this sequence we want the dogwalk. In this case I ask my student to face the door. While I’ve drawn a “containment” line; I’m quick to point out that distance work doesn’t have much to do with standing still. The dog comes out of the collapsed tunnel with only a moment to get movement and directional cues from the handler. When the dog passes the handler you’ll have to admit that the end of the dog with no eyes is the wrong end to show good directional cues. Now the handler wants to turn with a more dramatic display. 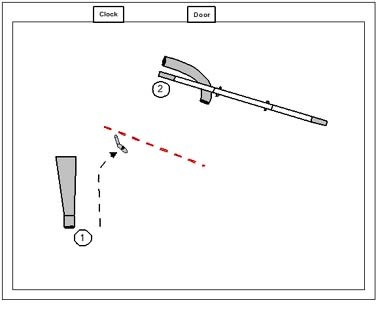 Note that a second turning command will be required as the dog will want to come up on the handler’s left hip. Again, the handler must demonstrate the turn before the dog slips past. Timing is everything. If you want to have a little fun with the sequence, finish with a wrap out of the tunnel up onto the dogwalk. Again there are likely important features of the handler’s movement that will help sell the transition to the dog. For example… after getting the dog into the pipe tunnel the handler might take a couple back steps and then apply pressure back towards the dogwalk as the dog makes his exit. Some dogs might only need for the handler to strike a path down the length of the dogwalk and parallel to it. This is probably a bit more advanced. It’s something I practice with my students with more up close handling. But distance handling is only a reflection of good up close handling. The dog turns when the handler turns,not where the handler turns. It’s been a terribly busy week. I’ve been leading our last camp of the year during the day. Every other hour has been busy with a variety of tasks, as I review TDAA courses, design my own courses for an upcoming USDAA judging assignment, and find a spare hour or four for private lessons and evening classes. On Friday as I wave g’bye to my campers I run jump into my Suburban to head for Nashville, TN where I’ll show my girl Hazard in a TDAA trial down that way. It’ll be a long grueling 7 or 8 hour drive and I hope not to arrive too friggin exhausted. The folks at camp are from the Cincinnati area. And for the most part they are regular students of mine. I’ve seen some of them grow from fumbling beginners to fairly sharp handlers and dog trainers. And this is one of my great joys in what I do. I can barely stand to look at the members list on Yahoo, much less the more undisciplined Teacup list. Shrill bad manners, badmouthing, name-calling, and unethical conduct are damaging to the TDAA. It will be a lot of work putting us back together again. As list moderator I should be lopping off a few pointy little heads. Most of our members are just agility enthusiasts who are happy to have a venue that showcases their little dogs. They don’t really want to see “how sausage is made” if you follow my drift. It’s a conflict of interest right now for me to impose extreme censorship on the real rabble rousers. It is better that our members see who they are and what they are. It’s late now, past midnight. And I have to get up at about 5:30 in the a.m. I couldn’t sleep and most of this nonsense was worrying at me. I worry about the world. And I really worry about the TDAA. I reckon if I win the special election with my accumulation of proxy ballots (roughly equivalent to the number of members who voted in our last election)… then I’ll for sure end the conflict at least in terms of quibbling and badmouthing on public discussion lists on the internet. Certainly the BOD and the judging corps will be purged of the worst of them. And then, frankly, we’ll start over again and concentrate on the needs of the agility enthusiast who is simply happy to have a venue that showcases their little dogs. Isn’t it funny how politics and the illusion of power will bring out the worst qualities in people? It’ll settle down when there’s no “power” to vie for. I’ve been grinding on my students for about a year now on distance training and handling. One of the essential tools for the handler is what I call the Tandem Turn. The Tandem is a form of the Rear Cross; but is distinguished from what we typically think of a Rear Cross by when we do it. The Rear Cross is a cross behind the dog on the approach to an obstacle. A Tandem is a cross behind the dog on the dismount of an obstacle, or on the flat. Some time ago I observed that the Tandem has a special quality or two. It creates a wide sweeping turn. Compare that to the Rear Cross which creates a tightened turn (if the dog reads the cross). The Tandem also creates separation and acceleration. That means it’s a terrific tool for distance work… if you follow the expression “creates separation”. In this sequence, for example, the handler might approach jump #3 with dog-on-right. And then showing the Tandem on the landing side can layer to the opposite side of the jumps while the dog turns and works away. 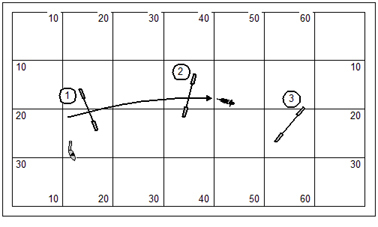 I might also argue in this sequence for the handler to layer to the opposite side of jump #1 while the dog finishes the weave poles and commits to the tire at #6. In this considerably longer sequence the handler might have another opportunity for a Tandem Turn on the landing side of jump #10. But I want you to also notice the #5 through #7 part of this sequence. I see a number of things my students might be working in this little bit. 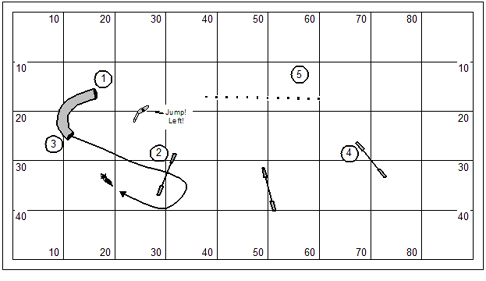 For example, we might see a pre-cue turn at jump #5; or the handler might work for a Front Cross on the landing side of jump #5. Just as likely… I’ll have students approaching jump #6 with a Tandem Turn in mind. The Tandem Turn might actually work here… but it’s a risky bit. If the important attribute of the movement is a “wide and sweeping turn” then by all rights the dog will be swept into the wrong-course pipe tunnel (#2 opposite side). So this is really a place where the Rear Cross is the correct movement. As I tell my students, 90% of the time the Tandem is better handling than the Rear Cross… but there are times when only a Rear Cross will do. By the way, it would be perfect in this short sequence to pre-cue the turn at jump #5, and then Rear Cross the dog at jump #6. We had a lot of fun with the “Onion” this week. Those sequences will likely appear in the #6 Jokers Notebook… if I ever actually get it published! Life is busy and strange these days. Having just finished a TDAA judges’ clinic in Dallas over the past week I have uppermost in my mind a discussion of ring efficiency and how important the judge is as the catalyst for a well-managed trial. Inefficiency results in what we’ll have to call dead time; that is time that creates lag, creates drag, and makes the day go longer than necessary. Nesting ~ The math is inescapable. If we have 10 transitions or course rebuilds a day that require 30 minutes to get done… we’ll have five hours of fundamentally dead time. Our target for a rebuild must be 10 minutes at an absolute maximum. Now we’re only at a mere hour and 40 minutes of dead time. Briefing ~ Because we play a limitless variety of games in the TDAA the written briefing must be complete and cogent and anticipate the questions an exhibitor might ask. It’s especially important that any strategy for play of the game can be grasped while the exhibitor is sitting in his seat outside the ring. This takes pressure off of both the briefing and the walk-through. The briefing for a standard course should take no more than two minutes; and possible five minutes for Beginners. The briefing for a game should take between five and ten minutes. Our goal is to average 8 minutes per game briefing. Walkthrough ~ The walkthrough should be allocated no more than ten minutes with first dog on the line after another two. 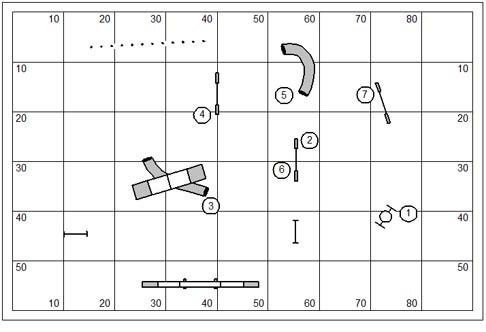 The judge needs to multi-task wheeling the course while exhibitors walk; report course distance to the trial secretary; find and brief ring personnel. Don’t fail to blow a whistle at the 10 minute mark and call for first dog in the ring in two minutes. Conduct of the Ring ~ Our goal is to run a dog a minute! The gate steward must be briefed on how/when exhibitors enter the ring; announcing jump height changes; alerting the scribe to changes in the running order. The scribe must check the scribe sheets against the posted running order so that they are in the same order. Out of order dogs can cause long delays and dead time in the conduct of a trial. In general the time-keeper should not look for a thumbs up “I’m ready” signal from the judge before telling the exhibitor to begin. Timely conduct of running dogs is the time-keeper’s responsibility and being awake is the judge’s responsibility. Furthermore the time-keeper should not delay for the ring personnel at the back of the ring who might be straightening the chute or resetting a jump bar. 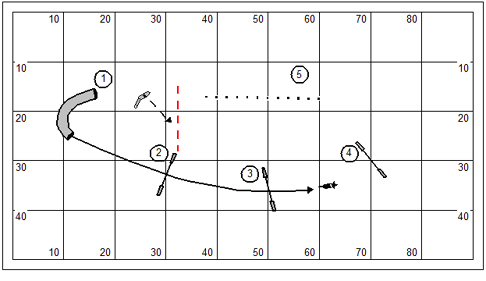 The judge might set and enforce a maximum course time and possibly a maximum fault limit. Also, the judge should have a low tolerance for dogs ceasing to work; though mostly these dogs can be caught out by a maximum course time. Courses should be designed to avoid conflict between the dog entering the ring and the dog exiting the course. Simple conflict can cause as much as 30 seconds delay between dogs. The course should begin at the front of the ring, near the entrance. 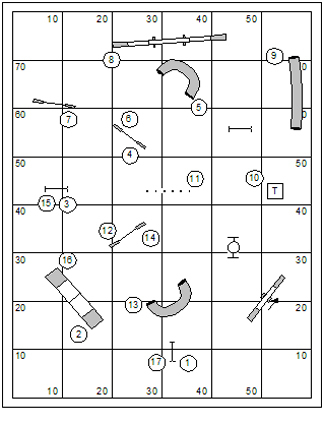 The course should end at the front of the ring, near the exit. Games should be perfect nested. This means that all dogs at all levels will essentially play the same game. 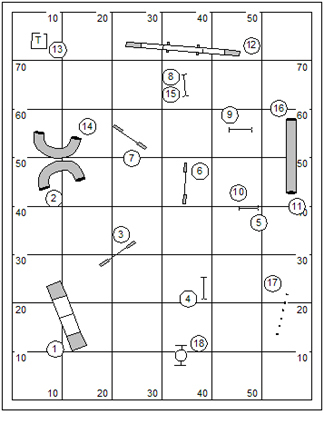 The distinction between levels will be established in variance of time on course and qualifying criteria. This allows the judge to give a single briefing and conduct a single walk-through. Let’s Go Back and Check the Math! That’s a total of: 440 minutes or about 7 hours and 20 minutes. A trial that begins at 8:00 in the morning should finish around 3:20 pm. Imagine how this trial might have gone if we did not. I’ve left out of this calculation down time for the judge taking a break or for lunch. In my own judging I do not seek a break for lunch; and will usually take lunch catch as catch can. With any luck the trial committee has provided for someone to bring the judge rather than requiring him to walk a half a mile and stand in some long line of exhibitors. That’s a silly excuse for down time. The toughest of all distance challenges is the dead ahead send. Like all skills, this is one earned by practice and a specific program to teach the dog his job. You’ll note in this drawing that the line of jumps is modestly curved. This is a small cheat only, acknowledging the tendency of a dog forward of the handler to curl back to the handler’s position. I’ve documented elsewhere, to a considerable extent, the training steps for mastering this skill. To state it simply: this is an “exploding jumps” training method for the dog. We begin with the jumps close together and gradually, over time, move them farther and farther apart. Like all basic skills we reinforce by putting the application of that skill into sequencing work. The dog can generalize the behavior and performance in more complex contexts. In this sequence I’ve added the proofing of an advance skill, calling the dog through the performance of the weave poles. In my own work I want to make sure my dog is following my instructions and not simply being a patterned smart aleck. And so I will mix into the work a variety of proofs of skills. In this working set I’m also interested in working with directionals. I can tell my dog “Jump Left” on any of the three jumps. Note that I use the directional as precue advance to my dog. That means I’ll tell him that he’ll be turning left before he actually jumps the jump. Okay I’ve been embroiled in big changes within the structure of the TDAA. I’ve also been engaged in a Top Secret dog agility project; code named Top Dog. As I write this I’m in the airport in Chicago, waiting for my flight to Dallas where I’ll be leading a TDAA Judges’ Clinic. I haven’t slept well lately. I didn’t really want to assume broader responsibility for the TDAA. I have no such ambition. But after about seven years of operation the politics have become insufferable; and the Association tends to be lax on the conduct of really basic business and customer service issues. Okay… just about a week later actually… I’ve returned home after conducting the TDAA judges’ clinic. It’s a fine bunch of new judges we’ll be adding to the web site. The competitors in the Dallas area were a lot of fun and have embraced the TDAA and welcome a venue dedicated to small dogs. I didn’t have a reliable internet connection most of the time I was there. But to tell you the truth I was generally too tired to do much work. I’ve started several different blog topics. I’ll try to spiff them up over the next couple days to share a thought or two with you. I have a lot of TDAA business pressing in on me. It looks like my semi-retirement is over for the time being. You are currently browsing the Bud Houston's Blog blog archives for November, 2010.